A policeman and a farmer pleaded not guilty to four fisheries offences when they were arraigned before Magistrate Hettie Mae Stewart on Monday and Tuesday, respectively. 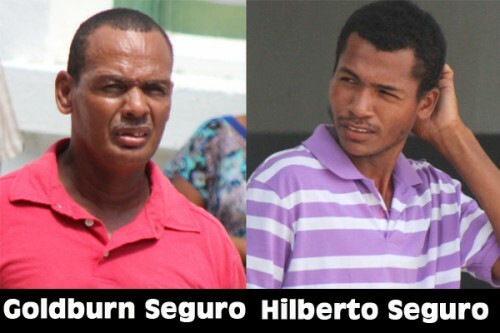 Goldburn Seguro, 53, a Special Constable who is the driver of Supreme Court Justice Courtney Abel, and Hilberto Seguro, 30, a farmer and resident of Biscayne, allegedly were found in possession of hickatee and hickatee nets. Golburn was arraigned on the charges on Monday and today, Tuesday, his nephew, who was summoned to court, was arraigned on the same four charges. And like his uncle, Hilberto also pleaded not guilty to the charges. The charges include one count each of being in possession of hickatee nets; one count each of being in possession of more than three hickatees, one count each of being in possession of a female hickatee greater than 43 centimeters or 17.2 inches in length, and one count each of being in possession of female hickatees less than 38 centimeters long. The two accused men had in their possession eight hickatees. In addition, they also had three female hickatees that are less than 38 centimeters in length. The incident occurred on March 27, at Black Creek, an area that is north of Sandhill, where Fisheries officer, Eric Arzu, came upon the two at a campsite around midnight. Both men were inside the campsite, on the riverbank. Inside the camp, Arzu found two crocus sacks that contained eight hickatees, four in each sack. Fisheries officer Hampton Gamboa told Amandala that the hickatee season runs for one month, from May 1 to May 31. According to Gamboa, no one is supposed to have more than three hickatees in their possession and it is illegal to catch hickatees using nets. If the two accused men are found guilty, they would be facing fines of up to $2,000 for each hickatee that they had in their possession. Both men are due to return to court on May 15.